Ulster Unionist Party Councillors Jim Rodgers and Sonia Copeland have threatened legal action following an exclusive Unionist Voice story on the secret bonfire injunction meeting. UUP Councillors Jim Rodgers and Sonia Copeland have threatened legal action following the publication of an exclusive Unionist Voice story on the secret Belfast City Council bonfire meeting. Sources within the meeting provided Unionist Voice with a detailed account of the contributions of all those present within the controversial meeting. Mr Rodgers has resolutely refused to comment in any shape or form on the meeting, continually citing a confidentially agreement between those present during the clandestine meeting. Despite this the veteran UUP man has now threatened legal action and presumably provided his legal advisors with his version of the confidential meeting. It is not clear whether Mr Rodgers will now finally break his self-imposed public silence in relation to the meeting. Taking to Facebook Mr Rodgers said he had contacted “legal advisors” and they were looking into the matter with “a view to prosecutions”. The term ‘prosecution’ is most commonly used when referring to criminal matters, however Mr Rodgers appears to be attempting to make reference to civil proceedings as no criminal law would apply. 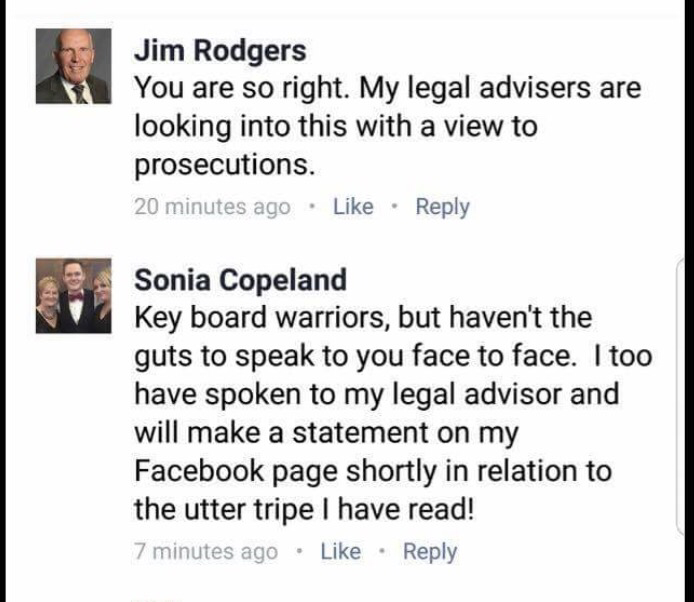 Fellow UUP Councillor Sonia Copeland has also claimed to have contacted “legal advisors”and has went a step further and promised to release a statement on her personal Facebook page in relation this matter. It is not known whether this statement will provide an account of the confidential meeting that has remained entirely secret until today. Unionist Voice would like to provide an open invitation to any of those present at the meeting to submit their account of the meeting and we will happily publish it as it is submitted. 140 Responses to "UUP Councillors threaten legal action over Unionist Voice injunction exclusive "
My spouse and I stumbled over here by a different web address and thought I might as well check things out. I like what I see so i am just following you. Look forward to checking out your web page for a second time. Do you have a spam issue on this blog; I also am a blogger, and I was wondering your situation; many of us have developed some nice practices and we are looking to swap solutions with others, why not shoot me an email if interested. wonderful issues altogether, you simply received a brand new reader. What might you suggest about your submit that you simply made some days in the past? Any positive? whoah this blog is fantastic i really like studying your articles. Stay up the good paintings! You already know, lots of individuals are looking around for this info, you can help them greatly. I used to be recommended this website by means of my cousin. I’m now not sure whether or not this put up is written through him as no one else recognise such special approximately my trouble. You’re incredible! Thanks! Hiya, I’m really glad I have found this info. Today bloggers publish only about gossips and internet and this is actually annoying. A good site with exciting content, that is what I need. Thanks for keeping this website, I will be visiting it. Do you do newsletters? Can not find it. Fantastic blog you have here but I was wondering if you knew of any user discussion forums that cover the same topics talked about in this article? I’d really love to be a part of community where I can get advice from other knowledgeable people that share the same interest. If you have any recommendations, please let me know. Cheers! Hey there! Someone in my Facebook group shared this website with us so I came to check it out. I’m definitely enjoying the information. I’m bookmarking and will be tweeting this to my followers! Superb blog and superb design and style. Usually I do not read post on blogs, however I wish to say that this write-up very compelled me to try and do so! Your writing style has been surprised me. Thank you, quite nice post. Amazing blog! Do you have any hints for aspiring writers? I’m hoping to start my own site soon but I’m a little lost on everything. Would you suggest starting with a free platform like WordPress or go for a paid option? There are so many choices out there that I’m completely overwhelmed .. Any recommendations? Cheers! magnificent submit, very informative. I ponder why the opposite specialists of this sector do not notice this. You should proceed your writing. I’m confident, you’ve a huge readers’ base already! Usually I don’t learn article on blogs, but I wish to say that this write-up very forced me to check out and do it! Your writing style has been surprised me. Thanks, very nice article. Just want to say your article is as astonishing. The clarity to your put up is simply cool and i can assume you are a professional on this subject. Well together with your permission allow me to clutch your feed to keep updated with forthcoming post. Thanks a million and please carry on the rewarding work. It’s a pity you don’t have a donate button! I’d definitely donate to this fantastic blog! I guess for now i’ll settle for book-marking and adding your RSS feed to my Google account. I look forward to new updates and will share this blog with my Facebook group. Chat soon! Wonderful goods from you, man. I have understand your stuff previous to and you’re just extremely excellent. I actually like what you’ve acquired here, certainly like what you are stating and the way in which you say it. You make it entertaining and you still take care of to keep it sensible. I can’t wait to read much more from you. This is actually a terrific site. My spouse and i ended up being so peaceful John could do his basic research from your precious recommendations he was given through the web page. It is now and again perplexing just to always be freely giving information which often the rest might have been trying to sell. And now we figure out we have got the blog owner to appreciate because of that. These illustrations you’ve made, the easy site navigation, the relationships your site help instill – it is everything astonishing, and it’s really letting our son and our family reason why that subject is brilliant, and that’s extraordinarily fundamental. Thank you for the whole lot! Wonderful site. Plenty of helpful info here. I am sending it to some friends ans also sharing in delicious. And obviously, thanks on your sweat! Whats up! I simply wish to give an enormous thumbs up for the nice information you have got right here on this post. I will be coming again to your weblog for extra soon. This is the proper weblog for anyone who needs to search out out about this topic. You notice so much its virtually laborious to argue with you (not that I truly would need…HaHa). You positively put a new spin on a subject thats been written about for years. Great stuff, simply nice! It is in point of fact a nice and helpful piece of information. I am glad that you just shared this useful information with us. Please stay us up to date like this. Thanks for sharing. naturally like your web-site but you need to test the spelling on several of your posts. Many of them are rife with spelling problems and I find it very bothersome to inform the truth on the other hand I’ll surely come back again. Needed to write you that little bit of remark to help thank you very much the moment again on the breathtaking opinions you have shared here. It is quite generous of you to deliver extensively all a few people could have marketed as an e-book to earn some money for themselves, especially considering that you might have tried it if you ever considered necessary. Those strategies in addition worked as a fantastic way to comprehend other people online have similar dream just as mine to figure out significantly more with regard to this matter. I’m sure there are some more pleasant times up front for individuals who read through your site.